The ripple effect that hockey personnel decisions create is always an interesting topic. Usually it is along the lines of “What if the <enter team here> traded for <enter player here> during their playoff run?” But sometimes, it is about a simple decision that a player made. When Vinny Lecavalier signed a five year contract with the Philadelphia Flyers, he unknowingly set the Dallas Stars up for future success. The Stars were reported as one of the final teams in on Lecavalier after he was bought out by the Tampa Bay Lightning. Many teams still believed in his ability and why wouldn’t they? He wasn’t coming off a bad season with Tampa Bay as he posted 32 points in 39 games. Most thought he had a lot of value left to offer. The Stars certainly did, as the offer from then-brand-new general manager Jim Nill was reportedly a four-year deal worth $4.75M per season. It was actually a higher average salary than what the Flyers offered, but Philadelphia offered an extra year on the deal. 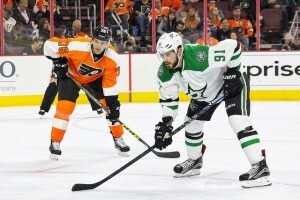 Lecavalier went with Philly and the Stars lost the Vinny-sweepstakes. The very next day, the Stars landed Tyler Seguin. What if Lecavalier Says Yes to the Stars? What happens to the Stars if Lecavalier takes their deal instead of the Flyers’ deal? The Stars were likely still going to be in on Seguin, so I’m not sure that had any effect on him coming to Dallas. That being said, if the Stars get Lecavalier the Flyers would have still been looking for a top center. Do they put together a package for Seguin that is more appealing than the offer set forth by the Stars? Maybe, although I don’t think Boston would have wanted him to stay in the same conference. Continuing down the path of that season, would the Stars have added Peverley and Horcoff if they already had Lecavalier and Seguin was coming to Dallas? Horcoff almost certainly would have been left off which actually might have been okay that season as Lecavalier had a better season than Horcoff did. Peverley, however, was a key part in the Stars success that season as he was able to play up and down the lineup. Going further to something we probably don’t want to consider, if Peverley wasn’t playing for the Stars does he have the cardiac event that forced him to retire? We’ll never know. That season, the Stars lost in the first round of the playoffs to the Anaheim Ducks in six games. The Ducks would go on to lose the next round to the Los Angeles Kings who ended up winning the Stanley Cup. With Lecavalier instead of Horcoff, the Stars would have actually been better off for that first season. Maybe they even beat the Ducks and change the landscape of that entire postseason. So maybe the Stars would have been better off had Lecavalier signed for that first season. After that, the Stars would have been in trouble. The following offseason saw the Dallas Stars trade for Jason Spezza to fill the role of second-line center. Had Lecavalier joined the Stars, that almost certainly would not have happened. With options limited, does Spezza say yes to the Nashville Predators at that point? If he does, Nashville may have taken out the eventual Stanley Cup champion Chicago Blackhawks in the first round of last year’s postseason. They also likely aren’t trading for Ryan Johansen this season, leaving him on the table for a team like Minnesota. It’s crazy how some of these things work out. Lecavalier saying no to the Dallas Stars opened up many opportunities. It solidified the need for Seguin. It allowed the Stars to pursue Spezza. Those are now two of the top scorers on the Stars and will likely be two of their best players for several more seasons. Does Johnny Oduya decide to sign in Dallas without Jason Spezza? Do the Stars execute the Patrick Sharp trade? We’ll never know. It certainly is a fun thing to think about. Have any “ripple effect” stories you want to share? Leave them in the comments below and thank you for reading.